It’s hot! That combined with the end of a year is a very good excuse to reflect and take it easy. December brought some very satisfying news. Redland Art Gallery has acquired Meeting Place VII and Common Ground from my exhibition back in September. How does one go about taking time out and relaxing? Go to a tropical island somewhere in the middle of the Pacific Ocean of course. 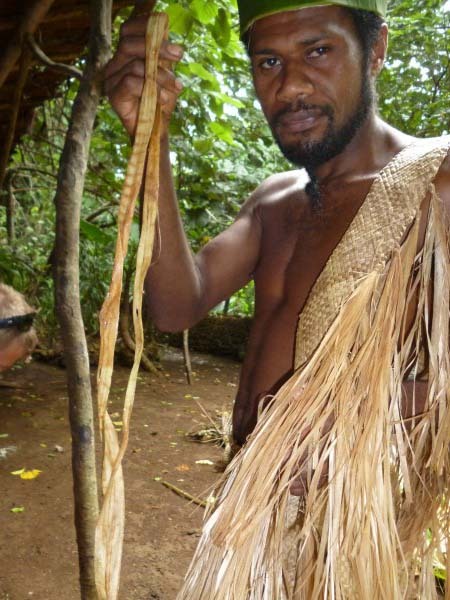 My daughter, Helen and I spent a week on Vanuatu. It was a perfect destination for that purpose. Of course I checked out any fibre related activities. 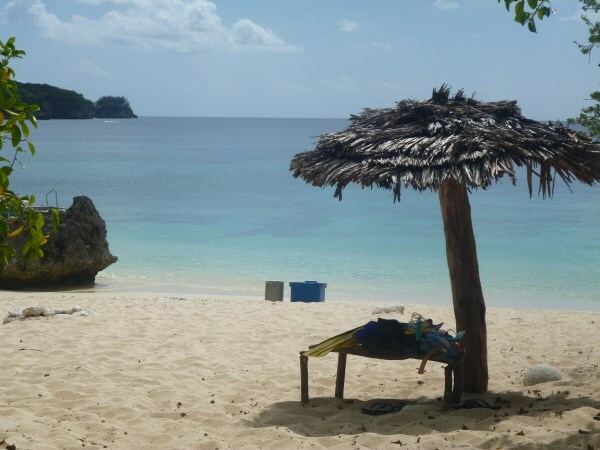 A deserted beach, clear blue water, reefs to snokle at and shade to sit under with a book….. perfect! 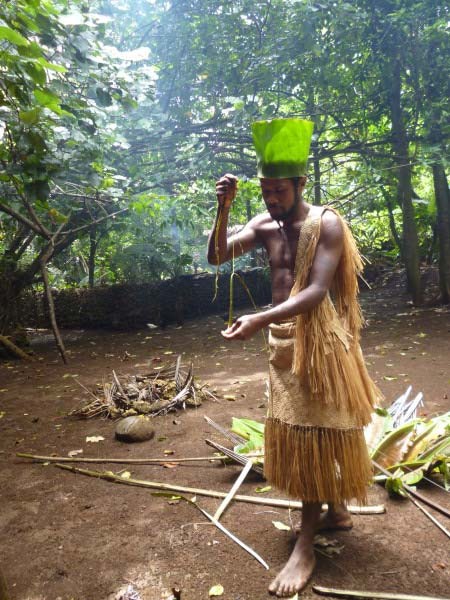 There were many structures including cabins with rooves constructed out of pandanus leaves. The pandanus leaves are folded in half and stitched with a long grass stem. 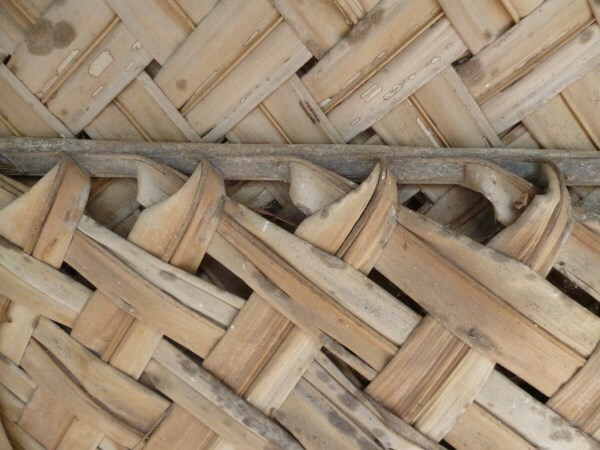 Each one overlaps and is attached to a frame to create a thatched roof. 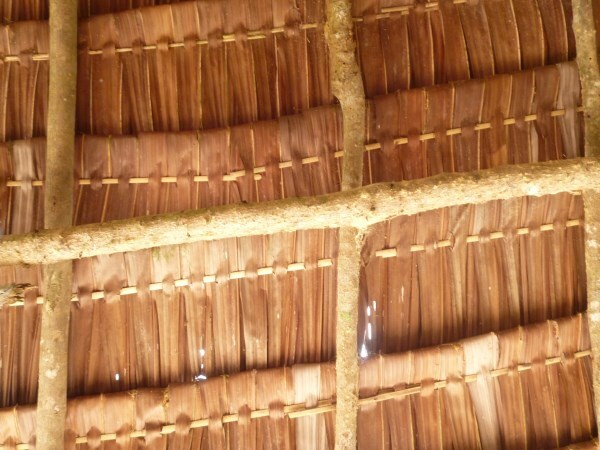 The walls of a cabin were constructed out of coconut palm leaves. Branches are cut down and the fronds woven. These are then overlapped on a framework. These walls last a couple of years before needing replacing. I saw a number of beach structures constructed in this manner including cabins for tourists to stay in. 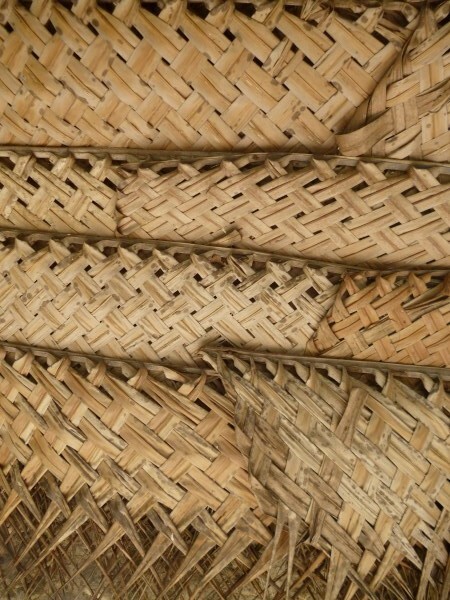 Detail of woven coconut palm fronds. This shows the outfit more fully. He is also demonstrating how to obtain a fibre from a different tree. As English is not his first language, he was unable to put a name to it. In this case the fibre is stripped in a similar manner but then left to dry for 2 days. It is very coarse and strong and used for string. 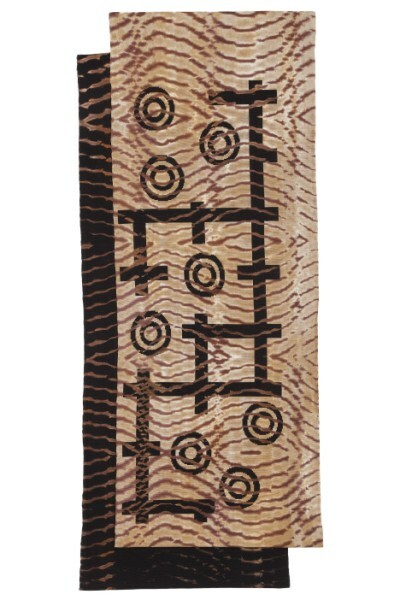 As a point of reference, the branches for both fibres are discarded on the ground. 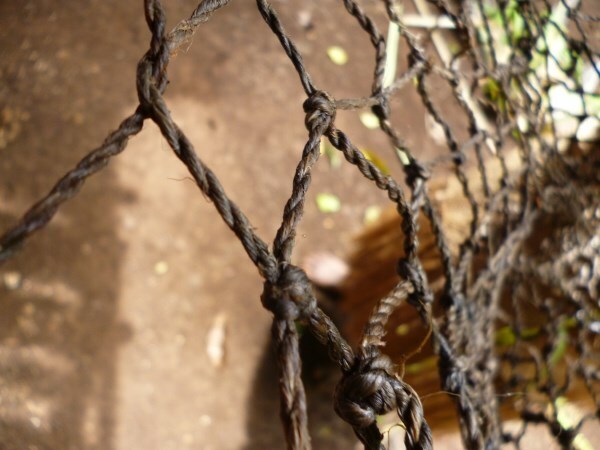 The string may be used for nets. Fibre of a different type: in this case spiders are collected and their web wound around a frame. This is then used to catch fish. The web is very sticky. 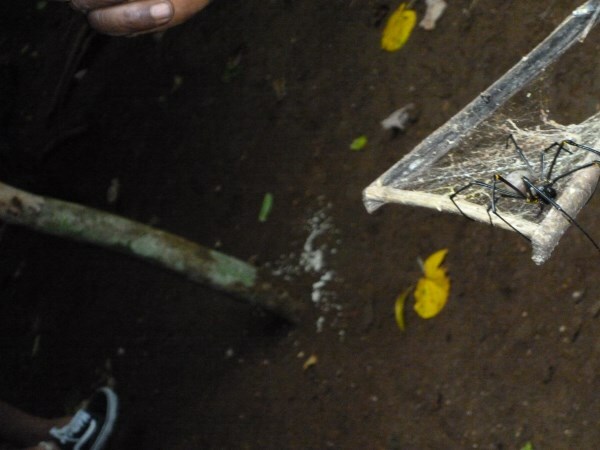 A bait is placed in the web, then when a fish bites the stickiness of the web doesn’t allow it to let go. 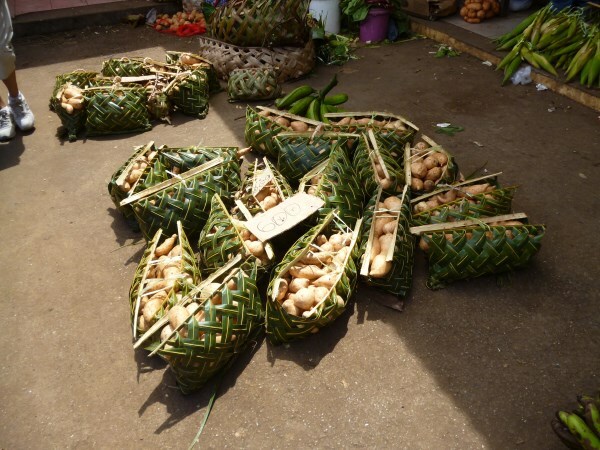 Woven baskets were also used to carry produce to market: another use for the coconut fronds. 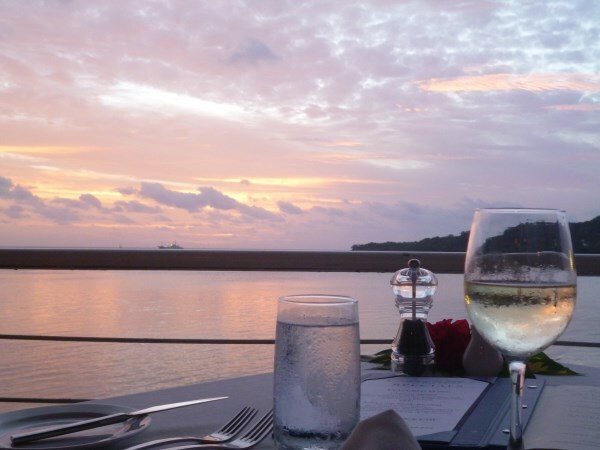 Day’s end at our favourite restaurant watching the sun go down: a perfect way to end the day and the year. 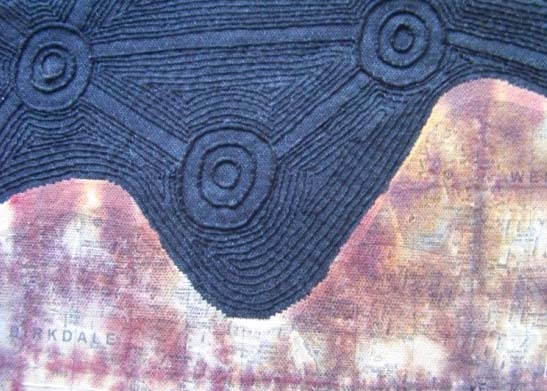 You are currently browsing the archives for the Textiles of Vanuatu category.